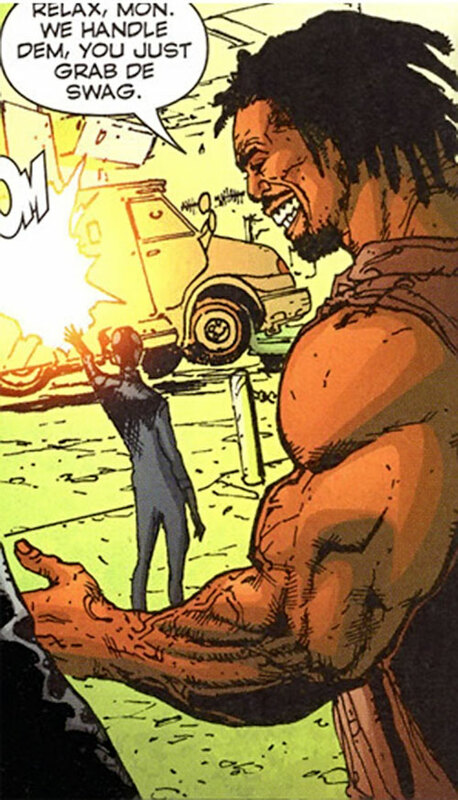 This obscure character only appeared in the 2007 StormWatch PHD run, set in the waning Wildstorm Universe. But he seemed handy to have and easy to use. Height: 6’5” Weight: 275 lbs. Superhuman strength. He’s strong enough to kick the head off a mass-manufactured Spartan robot. He’s also an experienced rude boy and criminal, conversant with both armed and unarmed violence. All in all, though, he’s just a C-lister. 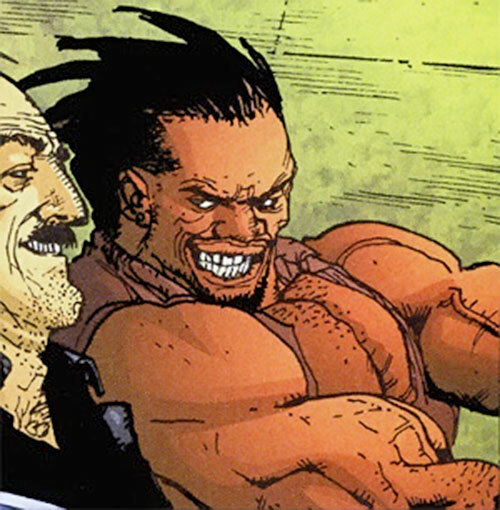 Superhuman criminal Johnny Too Bad became a friend of the Machinist in prison. He later came to work for the Ghost, a dreaded super-powered crime lord. 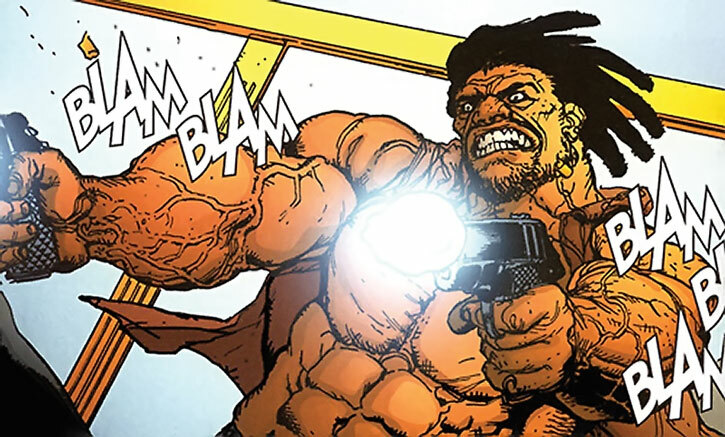 When StormWatch PHD started taking out the Ghost and his allies, Johnny was ambushed in the lavatories of a bar by operatives Paris and Lauren Pennington (formerly Fahrenheit). Although he drew his guns they closed in on him. The agents executed a combined throw to smash his skull against the washing basin. This tactic worked. Though he had bulletproof skin, this did not help with his brain smashing inside his skull from the impact. Johnny Too Bad was knocked out and arrested. Big, enthusiastic, friendly rude boy with a thick accent. He seems to be a simple and straightforward guy, fighting without genuine malice and treating crime and prison as just being da bidness, mon. He likes the usual fare – guns, fast cars, women of similar or superior velocity, alcohol, etc. There isn’t much room in this article, but let’s shoehorn it in. Skin Armour is also half as effective (i.e., 03 APs) against Energy Attacks (+1). Colt M1911 (x2) [BODY 03, Projectile weapon: 04, Ammo: 07, R#02]. Stats are speculative due to lack of material. – Protection 4 (Limited 1 – to Physical Impacts). All-out Attack, Close attack 2, Precise Attack (Ranged, Concealment), Quick Draw, Ranged Attack 2. Equipment 2, Language (Jamaican patois). Athletics 1 (+9), Close combat (Unarmed) 2 (+6), Expertise (Streetwise) 5 (+5), Expertise (Jamaican lore) 4 (+4), Perception 1 (+1), Ranged combat (Firearms) 3 (+7), Vehicles 4 (+6) (Limited 2 to common land vehicles). Light Pistol plus Feature 1 (one extra pistol). Distinctive appearance Johnny Too Bad is very large, hugely muscled and usually goes bare-chested, making him rather noticeable. Expensive tastes He furthermore has conspicuous and expensive tastes in cars, beverages, female company, etc. making him even more noticeable (and not as affluent as he might be). Rude boy Johnny is prone to impulsive behaviour to have fun. Trade-off areas Attack & Effect PL 7, Dodge/Toughness PL 8, Parry/Toughness PL 8, Fort & Will PL 6. Point total 74 Abilities 24, Defences 17, Skills 9, Powers 14, Devices 0, Advantages 10. Equiv. PL 5. Whether Limited 1 Protections ought to be counted in Dodge/Toughness and Parry/Toughness is debatable. Here we’ve counted half of it since, well, it happened to fall just right and it represents the character well. 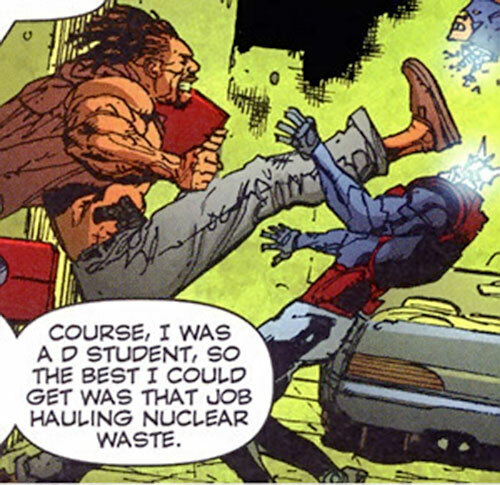 Source of Character: StormWatch PHD #2 (2007).